Sept. 26 - Coleman Barney, who was sentenced to five years in prison for his part in the Alaska Peacemakers Militia plot to kill government officials, filed paperwork with the U.S. District Court in Anchorage, Alaska, stating that he would appeal his conviction. Barney, 38, was convicted in June of conspiracy to possess unregistered silencers and grenades, and possession of an unregistered 37 mm projectile launcher loaded with an anti-personnel round. Sept. 28 - A judge in Lehigh County, Pa., stayed the life sentences of Bryan and David Freeman, neo-Nazi skinhead brothers who beat and stabbed their parents and 11-year-old brother to death in 1995, until legislators rewrite laws on sentencing juvenile killers to comply with a Supreme Court ruling earlier in the year that it was cruel and unusual punishment to sentence a juvenile to life without parole. Bryan Freeman was 17 at the time of the killings, and his brother was 16. Oct. 2 - Robert Clifton Tanner, an antigovernment “sovereign citizen” who federal prosecutors in Utah say was the brains behind a scheme to attack state court judges with unjustified billion-dollar debt claims, was denied bail until trial. Tanner, 44, identifies himself as a reverend with the “Ecclesia of the First Born of Christ” and The Holy Chosen Baptist Church. Oct. 19 - Prosecutors dropped charges against Mark and Jennifer McGowan, members of the racist skinhead group American Front who were accused of planning acts of violence in preparation for a race war. The husband and wife were two of 11 men and three women charged earlier in the year with participating in paramilitary training at the group’s compound in Osceola County, Fla.
Oct. 30 - Two of 21 members of the Aryan Knights, a white supremacist criminal gang accused of operating a methamphetamine and firearms ring, pleaded guilty in federal court to firearms charges. James Everette Hood, 40, and Rory Vincent Palma, 38, both of Boise, Idaho, pleaded guilty to illegally possessing firearms. Nov. 10 - Charlotte, NC More than 40 Klansmen and members of the National Socialist Movement (NSM), America’s largest neo-Nazi group, rallied against non-white immigrants, all of whom the NSM says should be deported immediately, “peacefully or by force.” But the extremists were met by a crowd of counter-protesters who outnumbered them by five to one — and who wore red rubber noses and a variety of clown outfits. As the rally proceeded, the counter-protesters confronted the white-power racists, chanting “White Flour” and “Wife Power” and generally ridiculing them. “The message from us is, you look silly,” said Lacey Williams, youth coordinator for the Latin American Coalition that organized the counter-protest. “We’re dressed like clowns, and you’re the ones that look funny.” The concept for the counter-protest, it turns out, actually began with a poem that was later turned into an illustrated children’s book, White Flour, written by singer-songwriter David LaMotte, a longtime peace activist. That book, published last May 26, was a reaction to another racist rally held exactly five years before in Knoxville, Tenn. “I did hope it would inspire some people,” LaMotte said, “but I did not at all foresee such a direct line from the book to a protest.” LaMotte said the book, illustrated by Jenn Hales and published by his Lower Dryad Music company, is meant to introduce children to the principles of nonviolence. Nov. 14 - Prosecutors charged an 11th person in connection with a militia group led by American military personnel based at Fort Stewart, Ga. Jeffrey Wayne Roberts, 27, who served about a year as a U.S. Navy airman recruit, was accused of illegal gang activity and possession of cocaine, marijuana and Ecstasy. Officials say the group, known as Forever Enduring Always Ready (FEAR), was plotting to overthrow the federal government and is responsible for the December 2011 murder of a recently discharged soldier and his 17-year-old girlfriend. 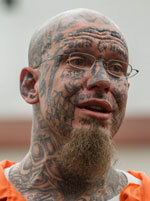 Dec. 5 - Curtis Allgier, a neo-Nazi skinhead whose face is covered with racist tattoos, was sentenced to life in prison without parole for murdering a corrections officer in Salt Lake City, Utah. Allgier, 33, gunned down the officer on June 25, 2007, while he was being escorted to a hospital appointment at the University of Utah. Dec. 19 - Randy Linn, 52, of St. Joe, Ind., pleaded guilty to setting fire to the Islamic Center of Greater Toledo in September. Linn, a former U.S. Marine, said he drank 45 beers in about six hours before driving to Perrysburg, Ohio, where he set fire to one of the center’s prayer rooms. He said he wanted payback for people being killed by terrorists.